I remember splurging on one of those super expensive Logitech Harmony remotes years ago. I really felt like it was a huge waste of time and money back then and returned it to the store post haste. So for many years now, I’ve been skeptical about buying anything Logitech Harmony ever again. Luckily I saw a video on youtube one day of someone turning their TV off and on with Amazon Alexa. Immediately I thought “How did they do that?”. So after researching a bit, I found that the best way is to use a Logitech Harmony Smart Hub with Alexa and then you use voice controls. I was still skeptical but in the end yes, I was happy and they are worth buying especially if you pair it with an Amazon Echo. There are some really great new features with the new Harmony Smart Hub. I mean they really have changed up their game. If you are out to control your entire entertainment experience then this is the hub you want to buy. You can use your smartphone or the included Harmony Remote (If you buy one with the remote) to control all of your entertainment devices. The app that is included for your smartphone has one-touch control of your entire entertainment system. The app supports both Android and iPhone. It allows you to save up to 50 favorite channel icons, volume control, playback of all different assortments of media and a whole lot more using friendly names. I remember back in the day I had a high profile client that needed a complete smart home set up. Now we are talking back a few years ago when they were REEEEALY expensive. One of his demands was that he didn’t ever want to see a cable box or for that matter any entertainment box of any kind. I thought to myself “that’s not even possible! If your remote can’t even see the box then how will the IR control it?”. Then his “media guy” walks into the room and says, “yup, we can do that”. I can’t even imagine what it must have cost back then to set up something like this, but nowadays it’s not as expensive and easily attainable by anyone. Especially with the Logitech Harmony Hub! It lets you control devices hidden behind cabinet doors or walls, including game consoles such as PS4, The Wii, and Xbox. That’s huge, and it’s been a long time coming. Programming the Harmony Smart Home Hub is really not that hard and is totally worth it. I think it took us a total of about 45 minutes to set up the hub and get all of our devices connected and acting as we had anticipated. The first step is to go to myharmony.com set up an account and download the app. Once you walk through the setup and get your devices connected. Now you will set up “activities”, which will allow you to tell each device what it needs to do and when. Basically, a Harmony activity combines your home entertainment devices into groups that say what they are used for. For example, a “Watch TV” activity will group the devices you use to watch TV – such as your TV, AV receiver, and cable or satellite box. You can watch the video below to see a basic explanation of how this works. Once you have everything set up. There are tweaks that you can make, which will enhance your experience. For example, when I first set up the Logitech Harmony Hub I noticed that my TV turned on and my Dish receiver turned on. However, the Dish, typically requires you to hit another button to wake up the receiver. That was no problem at all with the Harmony Smart Hub. I set up a delay of two seconds to let the TV turn on, and then set the Dish control to hit the back button. This wakes up the Dish and everything works correctly. So now, I walk through my living room every morning on the way to get coffee and say “Alexa, turn on the TV”. It does everything I need it to do in order to get the TV running without ever touching a button. If you lost your remote and are just too lazy to look for it, then this is the smart hub for you. Using Alexa or your Google Home you can tell it to change the channel to anything you want or even change the volume of your TV with voice commands. 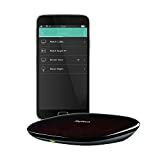 You will want to go to the official Logitech Harmony compatibility list before investing in the hub, just to make sure that you are good to go. You will find the link to that list here. That way you don’t get any surprises when you are trying to set the Harmony Hub up. Personally, I found that there were no issues setting up most of our devices. Those devices included everything from a Samsung Smart TV, several Fire TV/Firesticks, The Dish, a PS4 and few other items. Yes, this is compatible with both the Amazon Echo and the Google Home. Which was one of the reasons I purchased it in the first place. However, it does have some issues with smoke/CO detectors, cameras, energy management devices or moisture, brightness, sound, and glass break sensors. I did not run into those issues as my sole intention when I purchased this was as a smart entertainment hub. How Many Versions Of The Harmony Hub Are There? There are three versions of the Harmony Hub. Just to be clear, these three versions have three different price points. I’ve listed them from least expensive to most expensive. Harmony Hub – This is just the base hub unit that does not come with any extra remote controls. Harmony Companion – This is the base hub, plus a push-button remote control. Harmony Elite – This is the base hub that comes with a fully functional touchscreen remote control. Remember, you do NOT need a remote control in order for the hub to work. It will work fine with just your smartphone and the Harmony app. Is it worth it? Well, that depends on how many devices you want to control. For me, it was primarily the thought of controlling my TV with my voice that was the most intriguing part and made me purchase it. Not everyone has a techy mindset and if that’s the case then you might find this a bit more challenging to set up than other smart home products. In that respect, I would say that this is for a little bit more of an advanced user rather than the neophyte. All in all, it was a good purchase and I would highly recommend The Harmony Hub for anyone who is considering it. If you are interested, you can check out the current price here on Amazon. Also, while you are here, make sure you check out my 31 Smart Home Automation Tips For Beginners.